A stellar day all-around in Asia, but the Japanese markets enjoyed the majority of the region’s gains. The Nikkei 225 shot up 2.61% today – playing catch up as the market was closed yesterday. Three markets produced double digit growth today: Taiyo Yuden, Haseko, and Tokai Carbon. One of the more recognizable names, Toshiba, lost 5.89% today. The USDYEN stepped up slightly higher to 110.51. In China, the Shanghai index rose 61 bps on improved trade talks. With the dollar cooling, the USDCNY declined 27 bps to 6.7740. The trade talks entered their second day as US officials flew into Beijing yesterday. The US set deadline of March 1st seems to be approaching at a rapid pace. Some believe a deal must be concluded with both Trump and Jinping present. However, last week Trump insisted he wouldn’t be making the trip to see President Jinping this month. Gold rose 10 bps to 1313.20 USD a troy ounce, whereas silver slipped 16 bps. A good day for European stock markets with all major stock indices rising today (bar the HEX index). The FTSE 100 rose 6 ps. Teresa May called for more time to discuss a Brexit Plan. Opposition party Labour’s leader Corbyn described her strategy as running down the clock to force MP’s to have no other choice but to back her plan. Questions were raised as to when an extension of Article 50 will be required. At the moment, it seems no progress has really been made. UK should start to stand a bit firmer if they wish to survive on their own. The DAX rose 1.01% today, although recent numbers have shown that the German economy narrowly missed a recession. The German car industry in particular is starting to suffer. Economists estimate up to 15k jobs could be lost due to Brexit, equating to 1% of the total sector employment. The UK car manufacturing industry has taken a slump recently with investments falling 9% over the Brexit ordeal and car production dropping to a 5-year low. CAC and the MIB rose 0.84 and 1.12% respectfully. With the risk being put on at the moment, we saw the dollar weaken against the majority of the global currencies today. Euro was one of the big gainers winning 35 bps against the dollar. GBP/USD rose 25 bps, but still under the 1.3 level at 1.2881. Some positive news coming out Monday night drove a positive day in the markets Tuesday. Congressional delegates reached a tentative deal late Monday in an attempt to avoid a second costly governmental gridlock ahead of Friday’s deadline. The proposed agreement allots $1.4 billion to border security, including 55 additional miles of border fencing (but not explicit support for an official border wall). Any final agreement requires approval from President Trump, so we’ll see how this plays out. Separately, and more significantly for the long-term, trade talks with China resume after top U.S. negotiators traveled to the Chinese capital. Still no clear outcome, but most believe there is simply no way a comprehensive deal can be structured before the March 1st deadline for increasing tariffs to 25%. Another extension would seem likely, with some face-saving messaging about encouraging progress. The Dow jumped over 400 points today before closing up +372.65 (25,425.76, +1.49%). 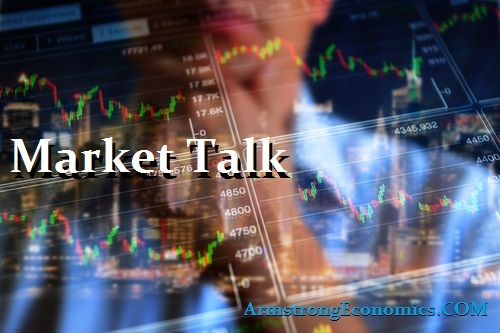 The Nasdaq Composite saw a similar percentage increase of 1.46% (7414.62 close, +106.71 points), while the S&P 500 rose 1.29% (2744.73 close, +34.93 points). The Russell 2K closed up +19.25 points (1538.23 close, +1.27%). Ending an eight-session consecutive winning streak, the U.S. dollar decreased today by -0.36% (96.71 compared to 97.05 in the previous trading session). The USD/CAD also decreased 0.0067 or 0.50% to 1.3237 from 1.3304 in the previous trading session. Major Canadian indexes also closed in the green today with TSE Composite and TSX 60 up 0.46% (15,642.23, +73.25) and 0.42% (933.14, +4.00) respectfully. The Brazilian Bovespa also close up +1.86% (96,168.40, +1,755.48). Crude oil for shot up 1.56%, the news emanating today was that Saudi Aramco have plans to expand into overseas oil and gas exploration. The company really highlighted their interest in the natural gas industry with possible positions for exploration being the Russian Arctic, the US, and even Australia who recently became the world leaders in exporting LNG. Saudi is currently 90% dependent on oil revenues and wish to reduce this between 40 and 50 percent in the future. The Italian 12-month BOT Auction sold at a lower yield than previously at 0.181% down from 0.285%. The Spanish launched a 6 and 12-month Letras auction with both selling slightly higher but negative yield at -0.372% and -0.307%. Japan -0.01%(+2bp), US 2’s 2.50% (+1bps), US 10’s 2.69%(+2bps), US 30’s 3.03%(+3bps), Bunds 0.13% (+2bp), France 0.56% (+0bp), Italy 2.85% (-4bp), Turkey 14.27% (+2bp), Greece 3.94% (-6bp), Portugal 1.65% (-2bp), Spain 1.25% (-0bp) and UK Gilts 1.19% (+1bp).